The New Year celebrations in Melbourne, attract crowds of people each year with the promise of colourful fireworks that brighten the night sky and welcome in a brand new year. Falun Gong practitioners were a peaceful, calming presence on New Year’s eve near the city plaza pedestrian area. Many people who walked by their booth offered them new year wishes and expressed support for their efforts to end the persecution in China. Ronan is a college student originally from Ireland. He and his wife Maria were drawn to the exercise movements and music. They asked many questions about Falun Gong and the persecution. Ronan and his wife Maria. 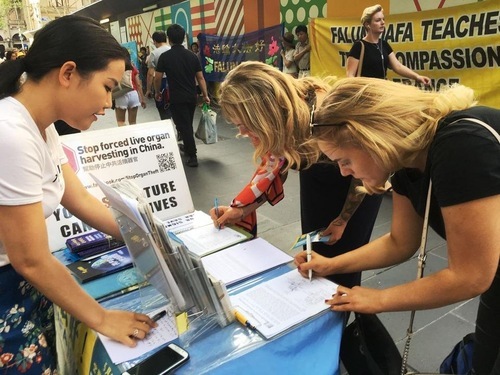 Despina, a fashion consultant at a large Melbourne department store, signed the petition and commented that people don’t really know that much about the persecution in China. She said she personally puts respect and kindness above everything else. “It’s absolutely very important for events like this to raise awareness of what is happening in China. Without the values of Truthfulness-Compassion-Forbearance, people are not compassionate and do things they aren’t suppose to,” she said. Ms. Liu, a practitioner, came across several young men from China. 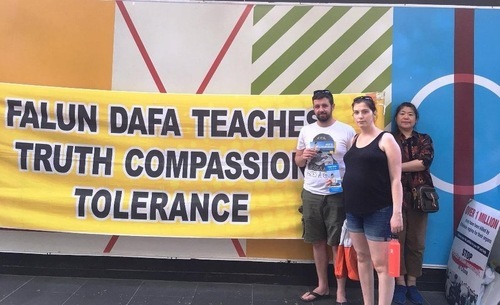 Initially indifferent, they listened to Ms. Liu explain Falun Gong and the persecution, and then quit the Chinese communist organisations they had joined while in China. The young man then asked her a lot of questions about things, such as the Tiananmen Square self-immolation. He learned that it was a hoax set up by the CCP to frame Falun Gong practitioners and justify the persecution. He eventually chose to quit the Young Pioneers, a communist organisation he had joined in elementary school. Around a dozen other Chinese also renounced their memberships in CCP organisations they had joined, and entered the New Year with hope for the future.